This came up yesterday in conversation with other Labour Party activists (yes, in a pub!) and the more I think about it the more convincing the argument. Now putting aside my aversion to John McDonnell MP for the moment. 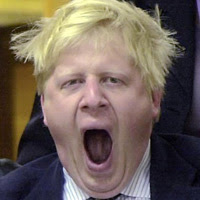 I don’t think that anyone seriously believes that he or Michael Meacher will be the next Prime Minister. The Electoral College is split 1/3rd MP’s, 1/3rd Trade union levy payers and 1/3rd ordinary Party members. They will get little or no votes (never mind nominations) from Labour MPs, maybe say 10% top from individual trade unionists(the big unions are not going to support either) and I think a similar amount from ordinary members. I like Luke Akehurst's comparison of two bald men fighting over a comb. Times have changed. What is important is that Brown would easily defeat such “left wing” candidates without sparking a real debate about post-Blairism and the future of the Party. Instead, what is needed is a challenge from the Right such as Clarke or Reid. Brown would then have to show how his politics and philosophy is different from the Right. There has been a lot of fuss and bother about encouraging Labour MPs to nominate either McDonnell or Meacher in order to “have a debate” about the future direction of the Party (they can nominate up to 3). This is barking up the wrong tree. What we should be doing is encouraging them to nominate Clarke or Reid. West Ham Labour MP (and UNISON member) Lyn Brown, Newham TULO activists, Forest Gate Councillors Michael Nicholas (who is a firefighter), Paul Brickell, Judith Garfield and Party members gather outside Forest Gate Centre, Woodford Road, London E7 to mark Workers Memorial Day. All are wearing the purple WMD ribbons. Every April 28 recognised across the world as a day of remembrance for those who have been killed at work or died of industrial diseases (about 4000 people per year in Britain alone). It is also a day to campaign on safety issues. Take 5 minutes to sign the two e-petitions on the 10 Downing Street website. One petition calls for the recognition of Workers Memorial Day as a national day of remembrance. The other calls for work-related road traffic incidents to be reportable just like other deaths and injuries at work. West Ham Labour Party has organised an event for members to meet the candidates. Hilary Benn, Jon Cruddas and Harriet Harman have confirmed they will be there. The first event will take place on Wednesday 23rd May 2007 at 8.00 pm. A second event for the other declared candidates who have prior arrangements on the 23rd is also being organised (details to follow). 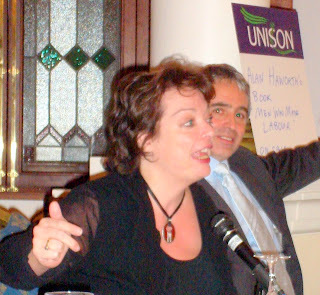 West Ham MP Lyn Brown will host the events which are being sponsored by London UNISON Labour Link. Neighbouring Constituency Labour Party’s will be invited. Labour Party members and trade union levy paying affiliates only. On Thursday I was invited to attend a reception organised by West Ham Labour MP, Lyn Brown which was sponsored by UNISON “Labour Link”. The event was held in the Jubilee Room, off Westminster Hall, Houses of Parliament. UNISON members who live in West Ham Constituency and who pay the Labour Party levy were invited. Lyn wished to thank trade unionists for their work in providing public services. Also, she wanted to talk to members (and her constituents) about important issues such as the campaign for a living wage and making the 2012 Olympics a success. It was a great success. About 60 members and their guests turned up. It was informal. There was a light buffet, a short speech by Lyn (seen above next to Sarah McCarthy-Fry MP Portsmouth North) and members went on tours of Westminster Palace. I enjoyed chatting and talking to ordinary UNISON members and their guests. The vast majority had never visited the Houses of Parliament and were really pleased to be invited to attend by their union and their MP. The first people to arrive came at 6.45pm and 2 of them signed up to join the Labour Party! I think that the UNISON members who attended where really chuffed and even those who could not make it appreciated the invite. I think this is the sort of thing that all Labour MP’s/candidates should be organising before the next election. Rushanara Ali former aid to Oona King has just been selected to be the Labour Party Candidate for Bethnal Green and Bow in the next general election. Commiserations to the other 5 shortlisted candidates (I am sure that we have not seen the last of them). However, Rushanara was the clear winner in tonight's ballot. Well done. I'm looking forward to getting rid of diss-Respect at the next election. Bethnal Green and Bow Labour Party unites around Rushanara Ali, Bethnal Green & Bow's diverse Labour Party membership has confounded expectations ,by selecting a female Bangladeshi candidate to stand for the constituency in the next general election. Rushanara Ali is only one of four women to be selected through open Labour Party contests in winnable seats in the last five years. If successful at the next General Election Rushanara Ali is likely to be the first Bangladeshi woman to ever be elected to Parliament. Rushanara Ali said: "I am proud to come from the East End, and I am proud to have received so much support from right across the community and thank everyone for their support. The East End is a special place, full of un-tapped talent. I am looking forward to working with everyone to win this seat back for Labour." "Iraq was clearly a major issue in the last election and like many in this community, I also opposed the war and marched against it with many loyal Labour supporters. Now, we need to focus on the bread and butter issues which people are worried about here at home, which are housing, jobs and education. I will be working with everyone this community to campaign on these issues, and working hard to unite our community." Council Homeless Persons Unit to ballot for Strike Action over Safety? UNISON and GMB members of Tower Hamlets Council “Homeless Persons Unit” (HPU) are carrying out an indicative strike ballot of members over health & safety. The Council have decided that there should be no safety screens in the HPU reception desks and most interview facilities. A building in Roman Road Bethnal Green is being refurbished as the new home for the unit. In the past there have been a number of violent incidents at the HPU. It is one of the most difficult and demanding jobs in the Council.As branch health & safety officer I attended an “open air” joint trade union meeting of about 50 staff yesterday in Millharbour, Isle of Dogs, E14. Staff was very worried out the prospect of screens being removed. As a last resort strike action is being contemplated although an urgent meeting with the head of adult services responsible for the unit, is being held next week. The vast majority of “homeless” applicants are of course perfectly ordinary people who are undergoing a housing crisis and pose no danger. However, there are some people who will vent their frustration on staff, as well as those who abuse alcohol or drugs or suffer from certain mental health illnesses. Staff do want to give the best possible service however, there has to be a trade off with staff safety. What is being currently proposed would mean that staff can be easily be hit or thumped across the counter and assailants can jump over it and prevent staff from escaping to a safe area. These sort of things actually happen. Not everyday, but often enough (and potentially serious enough) for staff to walk out and strike. Hopefully, we can resolve this without confrontation. Ironically, this is happening on the eve of Workers Memorial Day! Then on Saturday (28 April), there will also be a secret ballot of members which will be held at the Labour Party HQ in Cambridge Heath Road, Bethnal Green (10am to 5pm). Rupa has been selected as a Candidate worthy of support by UNISON “Labour Link” National Parliamentary Panel. I think she would make an excellent “crossover” candidate who would appeal and unite all the different communities and interests in BG&B behind her and the Party. She is a Bangladeshi Muslim woman who is not only proud of her community and her roots but also to call herself British. She is a Cambridge University graduate and holds a doctorate, but is also a working Mum with a boisterous toddler. Rupa has past experience of standing as a Labour Party candidate in General and European elections. 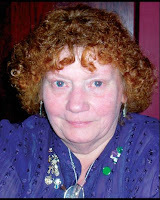 She is a long standing Labour Party activist, very hard-working, bright, articulate and committed. She wants to take on “Respect” and return BG&B to Labour and she has the presentational and media skills necessary to do so. Talking to Rupa you realise that she is Passionate (with a capital “P”!) about achieving Social Justice. Politics is not just about theories, but is about practical real life issues such as putting more money into pensioner's pockets, affordable child care for working parents, decent local housing & health services, combating crime and properly caring for our environment. Tomorrow is the 75th anniversary of the mass trespass that took place on April 24 1932. This is what Wikipedia says about it. "The mass trespass of Kinder Scout was a notable act of willful trespass by ramblers. It was undertaken at Kinder Scout, in the Peak District of England, on 24 April 1932, to highlight weaknesses in English law of the time. This denied walkers in England or Wales access to areas of open country, and to public footpaths which, in previous ages (and today), formed public rights of way. Political and conservation activist Benny Rothman was one of the principal leaders. A commemorative plaque now marks the start of the trespass at Bowden Bridge quarry near Hayfield (which is now a popular area for ramblers). This was unveiled in April 1982 by an aged Benny Rothman during a rally to mark the 50th anniversary. The trespass proceeded via William Clough to the plateau of Kinder Scout, where there were violent scuffles with gamekeepers. Several ramblers were arrested and some would receive jail sentences of 18 months, merely for diverging a few yards from a right-of-way. The mass trespass had a far-reaching impact, some of which is still playing out today. Eventually, changes in the law would allow all citizens access to public footpaths, regardless of whether they crossed private land. This culminated in the Countryside and Rights of Way Act 2000, which legislates a limited right to roam over scheduled access land (see Open Country). Ewan MacColl, the poet and folk singer, celebrated these events in his song The Manchester Rambler, and it is also the subject of a song on Chumbawamba's 2005 album A Singsong and a Scrap". Most of the original trespassers (Manchester based, who had the main “ruck” with the 8 local gamekeepers) walked up from Hayfield. On Saturday this year I walked up to Kinder Scout via Edale where the Sheffield marchers started off. Although I went up along the Grinsbrook Clough –Ugh – give it a miss! Came back down Jacobs Ladder. Apparently David Milliband MP was there that day to celebrate the anniversary (but I didn't see him – I did however see a Lamb being born on the hillside!). For the first time ever in the Peak District, the weather was actually excellent (in my limited experience). Blue skies, dry and warm. Workers Memorial Day (WMD - Saturday 28 April) is just over a week away. This should be one of the most important days in the Labour Movement calendar. 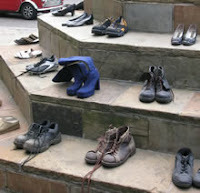 The picture left “Empty Shoes” refers to the 1000’s of ordinary British workers who die each year at work (e.g. 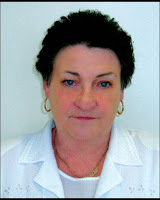 falls, slips, violence, road traffic incidents) or from industrial illnesses (e.g. contact with asbestos). This is the sort of thing that the Trade Unions and the Labour Party should work together closely to promote. It is a core issue. UNISON health & safety section has posted this useful information “Workers Memorial Day takes place all over the world on 28 April each year. Its aim is that those who have died because of their work are not forgotten, and so that those still at work are not silently left to the same fate. Remember the Dead, Fight for the Living. 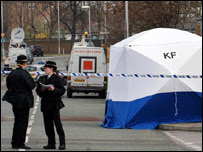 UNISON's slogan for WMD 2007 is: Health and safety laws work better when they're enforced! The TUC has a similar slogan: Health and Safety needs not just regulations, but also enforcement". More rights for safety reps.
finding out what your branch/other branches/unions, your local hazards group, or regional TUC or trades council are planning and taking part or organising a joint event. What is your local trade union or Labour Party branch doing to mark WMD? Photo above is of UNISON London Regional Council officers (yesterday - Lynn Bentley, Gloria Hanson, Khi Rafe, Alan Jarman, Me) wearing their purple ribbons to show their support. On Saturday 28 April West Ham Labour Party and Newham TULO will be holding a remembrance event in Forest Gate with local MP Lyn Brown. Calling All UNISON Members: Vote against Extremists! I got my UNISON (London region) ballot papers in the post this morning. UNISON Elections are also taking place all over the UK. It’s probably true to say for all postal ballots, that people tend to either vote within a day or so of receiving the ballot papers or not at all. So, please don’t put the ballot papers on the shelf for later. Fill out the ballot papers now and put in the post (and vote for trade unionists that put members first). Please make sure you vote and encourage all of your fellow members to vote. Below are centre left London Region Candidates. But elsewhere, a quick read of the election statements will usually tell you who are United Left (which is dominated by the SWP) and who are not. If you have not received your ballot paper by 23rd April, call the helpline on 0845 355 0845. Bethnal Green & Bow Labour Party PPC selection. Sorry this is a bit late but I have been away for a few days. Ayub Korom Ali didn’t make it into the shortlist. An absolute shame since he was an excellent candidate. Talent spot him for the future. Rupa is a member of UNISON and would be a winning candidate. On route to summit of Yr Wyddfa (Snowdon - highest mountain in Wales) with my sister's Lucy and Helen (with daft Chocolate Labrador "Jazz" and very serious Boarder terrier with the even more daft name of "Chili"). Off message, of course, but we try to walk up Snowden every Easter to remember our Dad, John Gray, (1929-2002) who died of a heart attack on April 14 2002 while on a long distance walk ("wild camping" aged 73 against all medical advice!) practising for his 5th Camino de Santiago also known as "The Way of St James" (Spain). We scattered his ashes on top of Snowdon. We walked up "Watkins path" (2nd picture) for the first time in many years. It is probably the most pretty and dramatic route in good weather (free parking) but the final climb through scree is pretty tough and only do it if you are well prepared (four hours up, 3 hours down). The third picture is of Dad's grandchildren, Hannah, Rachel, Matthew and David on an oak bench we have put up on the Marian, Colwyn Bay. With a plaque that says "John Gray Passed this Way"
Despite being a lifelong atheist, Dad enjoyed the challenges and fellowship of taking part in the longest pilgrimages in Europe. He was also a life long member of the Labour Party, former Buckley Labour Councillor and trade union activist. Ironically on April 14 2002 I took part in the London Marathon (never again! 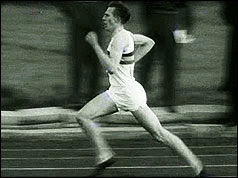 4 hrs 24 mins) which caused some confusion on the day about which "John Gray" had actually died! Remember Workers Memorial Day 28 April 2007. Thought I should post a picture of some of the members of the top Labour Party Branch, Forest Gate South, whose members tonight voted to reselect Lyn Brown MP and also had a blinding debate on knife crime (see last post). They are all wearing their WMD ribbons. Newham TULO will be holding an event to mark the day on the 28th in Forest Gate. Further details to follow. Recent Knife Murders - Should we have metal detectors in our Schools? Last night I was the West Ham CLP Executive committee observer at the parliamentary reselection meeting of Forest Gate South branch. There was another unanimous vote in favour of the existing Labour MP Lyn Brown. However, as I waited for the meeting to end to take the inevitable picture for my blog. There was firstly a very good discussion led by the branch chair Councillor Winston Vaughan about saving a local “after school” club threatened with closure (I use to work in a “after school club” in Edinburgh – the hardest job I ever did in my life - it’s another long story). Then local Councillor Akbar Chaudhary who is Newham Council Scrutiny Commission Chair brought up the matter that the Commision had been discussing whether secondary schools in Newham should have metal detectors installed to prevent pupils form carrying knives? He said that this had been very controversial amongst Labour Party Councillors and he wanted to know what the opinion of his local Labour Party branch was. There then followed a really constructive and informed discussions. A social, political and practical issue that touched all of us. It was accepted that this is not a “night or day” question. But a really difficult issue that there is probably no absolute “right” answer. One member who has links to a secondary school which has a very good reputation in Newham put forward the view that teachers fear that this is a real problem since a significant number of pupils are “tooled up”. Is it fashion or is it “self-defence”? Is it a “media exaggeration”? There is evidence that overall knife crime is reducing. Last month everyone fussed about “gun crime” this month it is “knifes”. Is this to some extent just the generational fear of the young? If you looked at the headlines and substituted the word “hoodies” with “teddy boys” you would find similar press headlines across the ages. I think that the link with crime and deprivation was accepted by everyone however, the fact that everyone present seemed to be genuine working class (who I am pretty confident were not tooled up) tells us more is at stake than purely economics. This debate is the sort of thing that showed the Labour Party in its best possible light. I am sure that the Councillors present will take on board the contributions by members. Below is a copy of a letter that UNISON London Regional office has sent out to all “Labour Link” members in West Ham CLP inviting them to a reception at the House of Commons. Local Labour Party MP Lyn Brown PPS to Phil Woolas, Minister of State, Department for Communities and Local Government (and long standing UNISON Member) will act as host (seen with Construction Union UCATT London & SE regional secretary Jerry Swain. UNISON Labour Link use to be known as the UNISON "affiliated political fund". Unlike many trade unions, UNISON has two separate political funds. One for the Labour Party and the other for "general" political activities. Such as campaigning against privatisation. Members can choose which fund (or none) they can pay into. All eligible (800,000?) Labour Link payers will have a vote by secret ballot on the future Labour Party Leader (Prime Minister) and Deputy Leader. This is the sort of event that Trade union liaison officers should be trying to organise with their local Labour Party MP’s (or candidates). This is not just a London thing. There are lots of similar events all over the country. I will let people know how it went. I would like to invite you and a guest to a reception that I am holding to thank trade union members for all they have done to make Newham a better place. It is also to mark the very hard work of trade unions towards improving the lives of my constituents on a whole range of issues, like Pensions, Equal Pay, the NHS, and so many other things. We have seen fantastic successes like the introduction of Britain’s first ever National Minimum Wage, unprecedented investment in our public services, and new laws to ensure trade unions are fully recognised by employers. We have achieved so much together over the past ten years but, of course, there is still work to be done. - tackling Newham’s classification by central government as an outer London Borough, which costs our inner-city Borough over £60 Million in government funding. The Reception will be held in the Jubilee Room, off Westminster Hall, at the Houses of Parliament. Light refreshments will be provided and you are invited to go on a short tour of the Palace of Westminster following the meeting. I would be most grateful if you could complete and return the enclosed reply form to let me know if you would like to attend by Tuesday 17th April. I hope to see you on the 26th. 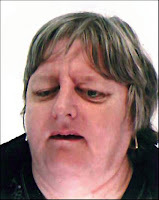 Former Baader-Meinhof suspect Johanna Kaschke, who was one of the 64 candidates hoping to be nominated as the next Labour Party MP for Bethnal Green and Bow, has resigned to join diss-Respect/SWP. I read about this first in the East End Advertiser where she was quoted as saying that the reason was over the Council’s decision regarding its housing policy. I was going to run a post on why the Advertiser had failed to even consider that a reason for her defection could have been her utter failure to pick up any nominations (or I think any individual votes). A case of “sour grapes” rather than a conversion while on the road to Damascus? However, this being Tower Hamlets the story developed, Dave Osler blog “Ex-punk. Ex-Trot. Unchanged attitude problem” (definitely not a New Labour Supporter) picked up that Johanna was also a former Baader-Meinhof (Also known as the “Red Army Faction”) suspect who was detained for 3 months on suspicion of being involved in terrorist activities. Baader-Meinhof was a particular nasty Left wing terrorist gang who murdered many people in Germany mainly during the 1970’s (and up to late 1990’s). They were found to be partly funded and supported by the communist East German secret police, the Stasi. German born Johanna is quite open about this (and other things) on her website. It would appear that she was released without charge and that she was given compensation by the German government for wrongful imprisonment. However, she does give the impression that she was involved in fund raising activities for the terrorists although this is unclear. To be fair, she is now firmly and openly against terrorism. Dave points out that she is a small business woman who is opposed to the minimum wage and wants more support for small businesses! Good to see the Royal Navy and Marines home at last, safe and well (in the circumstances). I think that they did a very good job under horrendous conditions. Faced with the prospect of summary execution or 7 years in an Iranian jail (pretty much the same thing) the "tongue in cheek" apologies by the Brits for the “apparent” intrusion into Iranian waters, fooled no-one except their less than bright kidnappers. Irony is apparently lost on Islamic fascists. Who it is clear simply had no idea how this television footage was being interpreted world wide. Nor the support they had created for a pre-emptive attack on their nuclear facilities (which I don't share - at the moment). While the “Far Left” and “Right” (increasingly two sides of the same coin on such issues) in this country haven’t exactly showed much judgement on how to respond. On the one hand we get the usual suspects such as John McNoHoper MP sticking up for Iran and we get twassocks such as the Daily Mail who attacked the hostages as “puppets” who should have fought to the last bullet. There are elements in the Far Left who will automatically side with anyone who appears to be “anti-American”. See the tosh spoken also about Mugabe, while the Daily Mail is also so keen to attack Labour that they will stoop to any depths. The person who seems to have come out of this the best is Tony Blair. “Tone” and I have had our differences over the years. However, he and Beckett seem to have handled this very well. By being firm but measured the Iranians were boxed into a corner and realised that Britain would not apologise to Iran and they had to back down. I think that we ought to make sure that boarding parties are properly protected in the future and that Iran is aware of what will be the militery response if they try a similar trick in the future. If any Iranian warship comes any near any British craft then the Iranians face an early bath. Last night Forest Gate North Labour Party branch (one of nine branches in West Ham Constituency Labour Party) voted unanimously for Lyn to be re-nominated as the Labour Party Parliamentary candidate for the next general election. All sitting Labour Party MP’s have to face a trigger ballot for reselection. If a majority of local branches and affiliates support the sitting MP then they are deemed to have been reselected. If they do not get a majority then a full selection process will take place. Other candidates can then stand against the sitting MP. Despite it being the eve of a Bank Holiday, 11 members eligible to vote turned up and all voted to re-nominate Lyn. John Saunders from the CLP Executive was there as their observer. Conroy, Irene, Louise & Kim are standing in the forthcoming UNISON NEC elections. A vote for them is a vote to put the interests and participation of our members first. It is a vote to celebrate diversity and independent thought and to build the respect of the membership through progressive policies. With the election of a new regional convenor 12 months ago things have begun to change in the London region. We have a more representative and democratic structure with the disproportionate influence of a vociferous minority reduced. 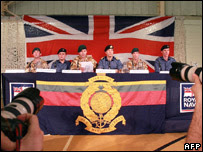 We have also witnessed record membership recruitment across all service groups. Now we must build on our success by ensuring London’s elected representatives on UNISON’s NEC, the ruling body of the Union, genuinely reflect our members views. The London region must not be held to ransom by the politics of extremists, with their narrow opinion on what the union should do for its members. We believe all members should have equal access to our union. Those with the loudest voices should not be allowed to dictate the agenda. We believe in dialogue and negotiation, not confrontation. • promoting equality for all across the union as more than two thirds of our members are women, a third of members in London are black or from an ethnic minority. You will receive a ballot paper at your home address shortly. Please take the time to complete and return. Have pride in being a member of a strong union that defends public services and provides quality support for its members. Vote for Conroy, Kim,Louise and Irene. Conroy, Kim, Louise and Irene are standing in the forthcoming UNISON NEC elections. A vote for them is a vote to put the interests and participation of our members first. It is a vote to celebrate diversity and independent thought and to build the respect of the membership through progressive policies. The branch Executive of the Royal Borough of Kingston UNISON supporting "Workers Memorial Day" by proudly wearing their purple "forget-me-not" remembrance ribbons (pictured inside Kingston Guildhall). Yesterday I attended the Executive meeting to speak them about the workings of the UNISON London region and LGPS Pension Governance. I was there to speak to the branch on behalf of the elected regional lay officers Alan Jaman (Convenor), Gloria Hanson (Deputy Convenor), Lyn Bently (Publicity) and Sarah Lewis (Young Persons Convenor). All of us have been trying to visit as many London branches as possible to listen to members and take note of their concerns. Beforehand I was at a meeting with branch Secretary Alex Yap and UNISON area organisers Maggie Jones and Jay Williams. They are taking part in a branch development partnership plan (an interest close to my heart!). It was a really interesting meeting. There is a lot the region can do to support branches, recruit and retain members. Organise or die! Finally, a picture taken of Alex on route to a union meeting. Alex has obvious negotiated a top trade union facilities agreement with the Council! (picture taken last Sunday). Nothing is too good for the workers. Totally agree with this press release from Brendan Barber. Clearly, the Tory attack dogs are on the prowl. I agree that "Fat Cats" are more to blame than Brown. Check out top pensions blog (the only one?) Capital and Labour for more common sense about this and other issues. "Don't let employers get away with blaming Brown for pension cuts TUC General Secretary Brendan Barber has hit out at those blaming changes in the way dividends are taxed introduced in Gordon Brown's first budget for the decline in occupational pensions. Speaking to union officials at a meeting in Congress House, he said: 'Neither employers nor opposition politicians should be allowed to get away with blaming Gordon Brown for cuts in occupational pension schemes. When the tax rules were changed, pension funds were generally in surplus. Many companies had got used to long contributions holidays, and with typical UK short-termism had no plans for restarting contributions. Many companies used pension surpluses to make people redundant through early retirement. 'But when reality returned and employers started facing bills for their pension schemes once again, the retreat from quality schemes began. Stock market pressures and longer life expectancies have caused far more difficulties than the tax change, which it should not be forgotten, was meant to encourage more long-term thinking in Britain's boardrooms and boost investment. 'But the bottom line is this. Many employers thought they could get away with cutting the pension of their staff, usually while gold plating those in the boardroom. And unsurprisingly they looked for someone else to shoulder the blame, and chose the Chancellor as their fall guy. Nominations have now finished. Two candidates have secured 51% of the nomination votes. This means they automatically go on the short list. The candidates are: Lutfur Rahman and Rushanara Ali. Well done. This leaves the following candidates with nominations from whom the rest of the shortlist will be drawn from. They are:Rupa Huq, Shiria Khatun, Ayub Korom Ali, Helal Abbas, John Biggs, David Edgar, Abdul Asad, Moti Uzzaman and Shirajul Islam. The two females i.e. Rupa and Shiria will automatically be placed on the short list because of the 50% rule. Congratulations. This means the remaining two candidates will be chosen from the following:Ayub Korom Ali, Helal Abbas, John Biggs, David Edgar, Abdul Asad, Moti Uzzaman and Shirajul Islam. So two of us out of the above seven will be selected at a shortlist committee of Bethnal Green & Bow General Committee on April 14. I am really looking forward to this. Then the six short listed candidates will face a husting on April 26 with polling day count on April 28. So Ayub will be up against some pretty serious opposition for one of the two short listed vacancies. There will be a short presentation and Q&A. Ayub gave a blinding interview at UNISON Parliamentary panel and the London region selection process. I am sure he will come through on the 14 April. 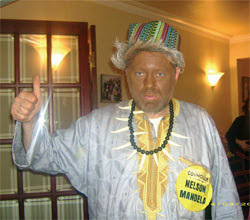 I think that he is the candidate to unite all communities behind Labour at the next general election. I know that this post has already done the rounds in Labour Party blogs. But I think it is really important that trade unionists remind themselves about who the real enemy is and why. 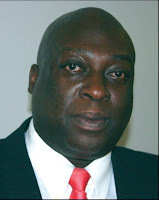 This is a picture of Hendon Tory Councillor Brian Gordon. This is not a "one-off". In 1977 Brian Gordon was the Conservative candidate for the Burnt Oak by-election, he told a meeting of Edgware Conservatives that he wanted an end to immigration because he felt that Britain should not be the 'dustbin' of the world At the same time he has also been accused of calling for an electoral pact between Conservatives and the National Front to defeat Labour. While we have our differences with the present Labour Government it is clear in my view that it is in the overwhelming "interest" of trade union members that a Labour government continues to govern and is re-elected. The Tories are in the lead in opinion polls, not so much because of Labour failings (and there has been a few) but because the Tories have suddenly decided that they don't like being in permanent opposition and want to return to power. To do this they are trying to publicly ditch their old policies with a young, articulate leader and capture the centre ground. Sounds familiar? However, it is still clear from policy statements that they want to introduce insurance in the NHS, dismantle public sector pensions, end national pay bargaining, compulsory privatise all Council services, cap the minimum wage, get rid of pension credit etc. Thanks to Gweirdo and Hendon Times. 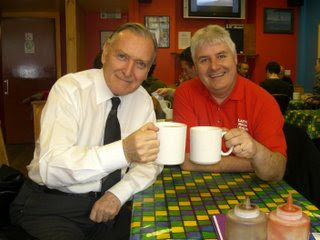 Good to see former Flintshire MP Barry Jones (left) on “bloggers4labour” post tonight. He is supporting top Labour candidate Martin Eaglestone, a Labour Party candidate for the Welsh Assembly. I joined the Labour Party in Holywell, North Wales in (I think) 1978? Barry was our local MP. I can’t remember the first time I met him. It was either in a Holywell Council by-election or the 1979 general election. 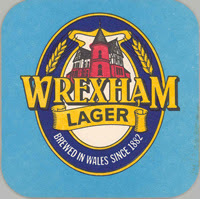 A lot of Wrexham lager was flowing at this time. However, I remember him driving me around during a local campaign. I would jump out of the car and deliver a leaflet then we would move off to another address. He was very pleasant and “normal”. None of that “I am a MP” great man nonsense. I wonder if Connah's Quay Labour Club is still about? I remember the Holywell By-election, because on the day, I was with a local trade union steward (Paul? Shotton steel worker or textiles mills?) who’s effective but unorthodox campaigning tool was to stand on a wall looking out for people and grab workers on the way home from work to go and vote Labour. People would actually try to hide and run away. But he would always catch them and send them off to ballot box. This is of course totally unlike modern day Tower Hamlets or Newham (joke). I am going back home to Wales for a long weekend after Easter and must help out the local party for an hour or 3.